Campaign update #2 - Youth Guarantee campaign hits the road - Spain, Portugal, Ireland & Bulgaria - Your future is my future - a European Youth Guarantee now! 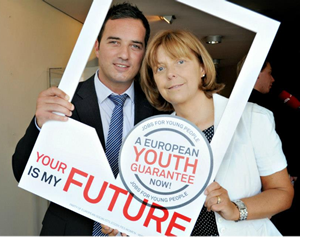 Last week we told you about the progress of the European Youth Guarantee campaign over the summer. In Spain and in Portugal, PSOE and PS presented in their national parliaments draft resolutions to make the Youth Guarantee a reality in their countries. The conservative governments, stuck on their austerity ways, rejected these progressive proposals, but our campaigners won’t give up; they will present the Youth Guarantee to trade unions, NGOs and civil society associations in order to create public pressure to implement it. In Ireland, on September 8th, Labour Youth gathered numerous of participants in a seminar to discuss how to reverse the high level of youth unemployment (1 out of 3 young people can’t find a job) and stop the emigration of youth. The speakers - including Minister for Education and Skills Ruairi Quinn, Emer Costello MEP and John Lyons MP - and the audience concluded that a Youth Guarantee can be part of the solution and make a difference to the lives of young people in Ireland. Also on September 8th Bulgarian campaigners organized a meeting near Plovdiv, the second biggest city of Bulgaria. Among the conclusions, the participants proposed that the years spent studying are taken into account for pension purposes. At EU level, thanks to the commitment of Commissioner for Employment and Social Affairs, Laszlo Andor, the European Commission has put forward a concrete funding opportunity to introduce youth guarantees. You too can join the thousands of campaigners calling for a European Youth Guarantee. Remember, your support is key to tackle youth unemployment in Europe. Check back next week, when we will have news on developments on France, UK, Finland and EU Committee of the Regions.